Martin Kaymer can end Tiger Woods’ five-year run as the top-ranked golfer with a win at the Andalucia Masters at Valderrama. Who? Shows how much golf needs the old Tiger Woods. I’m not familiar with Gordon Pinsent, but he has the perfect voice to read Justin Bieber’s memoir. One top network researcher’s calculations concluded that Univision could surpass the Anglo networks in seven years, even without the boost provided by growth in the Hispanic population. 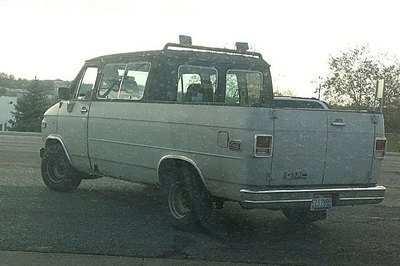 When a regular pickup truck isn’t quite big enough. You don’t see something like this every day. Saw this on SI.com this morning. Oregon Ducks uniforms in yellow and brown. 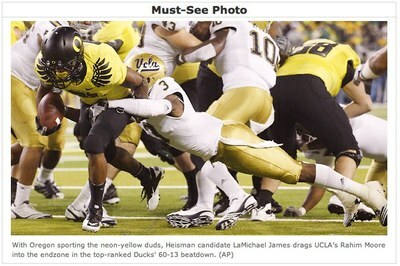 I love the fact that they’re using the total duck color pallet in creating their uniforms. So much for not doing evil. For the benefit of the shareholders, corporations are sending jobs overseas and using foreign subsidiaries to avoid paying taxes. I saw his Origami work in the documentary Between the Folds and it is incredible. Between the Folds is a film about origami and the artists involved. I saw the film on streaming Netflix and found it be quite an interesting film. Paid apps don’t do well but free ad supported ones do well? I think Google could care less about paid apps since their whole business model is about selling ads. The tweet itself isn’t the problem, but the bit.ly link was truncated, creating a link to this YouTube video which pretty much leaves me speechless. The NBA is prohibiting its players from wearing a new line of sneakers that claims to increase vertical leap. These shoes have not been shown to definitively increase jumping height, but the fact that the have banned from the NBA is marketing gold. Makes it a must have for rec players everywhere.